A Hello! from Ripon, Wisconsin where I’m having a wonderful time at CIMidwest 17!! A wonderful shootout of THANKS to Erica Peplinski, Kelly Ferguson, Marta Ruiz, Grant Boulanger and Haiyun Lu, the organizers of this amazing event. I am SO excited to be teaching Level 1 again this year! The classes are mostly 6th graders with a few 7th and 8th graders here and there. Last year I jumped in with this level on November 1st…..almost 14 weeks in….so to be here from Day 1 is fantastic!! I decided to try to convince them that Spanish was going to be easy….on Day #2. Hay ____ estudiantes en la clase. So they didn’t have much to start with. Now….let me say up front that I didn’t expect them to acquire anything from this exercise…..I just wanted them to experience success! Me: Your job is to respond to me when I speak Spanish to you. If you do not understand what I said, please stomp your feet until I hear you and stop to explain so that you understand. (I blab in Spanish until they stop me) Excelente! What English word do you hear in “Excelente”? I ask a student to set the timer on his phone for 10 minutes. Me: Clase, (I point to poster hay-there is or there are) un marcador (marker). Some students stomp. I write “marcador” on the board. Me” What word do you see/hear in English when I say MARCADOR? Me: Clase, Hay un marcador. Me: El marcador es importante. I wrote usa (uses) and dibuja (draws) on the board. Me: La Maestra usa el marcador. Students: Ohhhh. 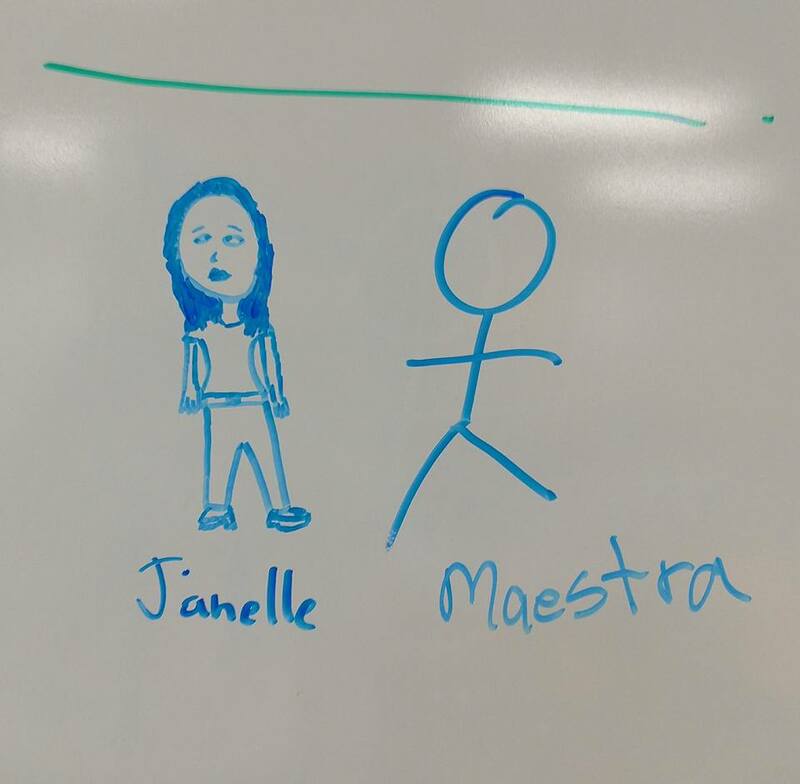 I drew a “lovely” stick figure of a person on the board. 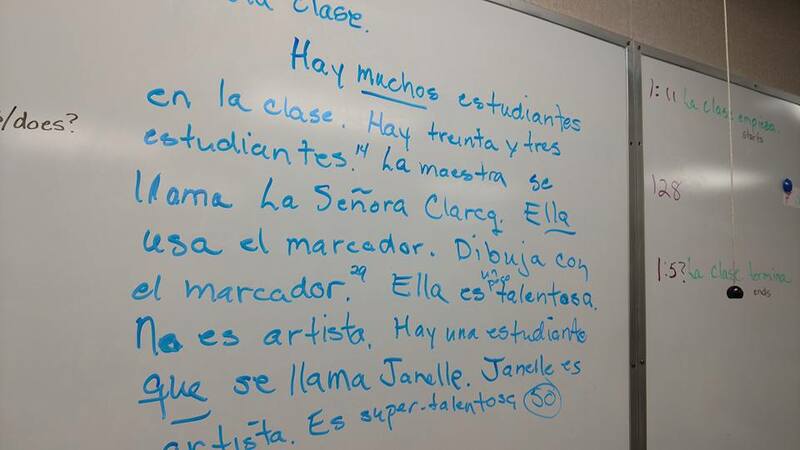 Me: La Maestra es talentosa. Students stomp. I explain talentosa/talented. I restated the sentence depending on the class answer. Me: Clase, who thinks that they could draw a better person than I did? While the student was drawing…..
Me: Clase, hay )point to poster again) un artists famoso en la clase. Students stomp and I write artist famoso (famous artist) on the board. Each time I am making sure that students “ooh” or stamp after my statements. Me: Mercedes usa el marcador. Mercedes dibuja con el marcador. Mercedes dibuja una persona con el marcador. Mercedes es famosa a Eich Middle School. Es famosa en Roseville. Es famosa en California. Clase, Mercedes es MUY (with gesture) famosa. About this time the timer also went off….if not…it was close and I could simply go back and repeat sentences until it did. I am going to write down what we just talked about on the board. While I am writing it in Spanish, I want you to share with a partner what it means in English. Then, I read it in Spanish, sentence by sentence, and they said the English. Talk about excitement!! Many of them took a picture to share at home and several asked me to text it to their parents, which made me smile. I reminded them that they hadn’t acquired it yet, so they should not be surprised if they don’t remember it all. But…..that Spanish was going to be this easy!!! that Spanish will be easy!!!! Since I was a little girl, I’ve dreamt of working in the perfect room. I’ve seen them on Pinterest. They must exist somewhere. But the truth is, they don’t exist in my world. Perhaps your world is different. Perhaps you have unlimited time and unlimited funding. Perhaps you have no other distractions. Perhaps. Or….your world is much like mine. The ideas all exist….in my head. The potential exists….in another reality. The desire exists…..every year. But the reality does not. But almost a decade ago I gave that up. I didn’t really have a choice at the time. You know, building construction, Xerox breakdown, no paycheck for July and August, two sons to get ready for school, moving to a new house, etc. etc. etc. A few students asked me, “Where’s all your stuff?”. But not many. In fact, a few students actually told me that they liked the new “quiet” look. That was eye-opening. And we started the year. And as things were needed, we made them and we put them up. The kids made most of the posters and decorations and they really preferred it that way. I still have dreams of the prepared and laminated loveliness of my early days. I’d love to have a gorgeous little Pinterest page-worthy environment. I don’t have to live up to my First Day decorating prowess. I have more money in my bank account. I have students who love to hang out in the room and create materials and decorations. The students, their needs, and their work has become the focus of the classroom. Yes…I’m talking to myself again. The last two weeks weren’t easy. I’m still stopping, and waiting, for some groups. Ok….all of the 6th grade classes. 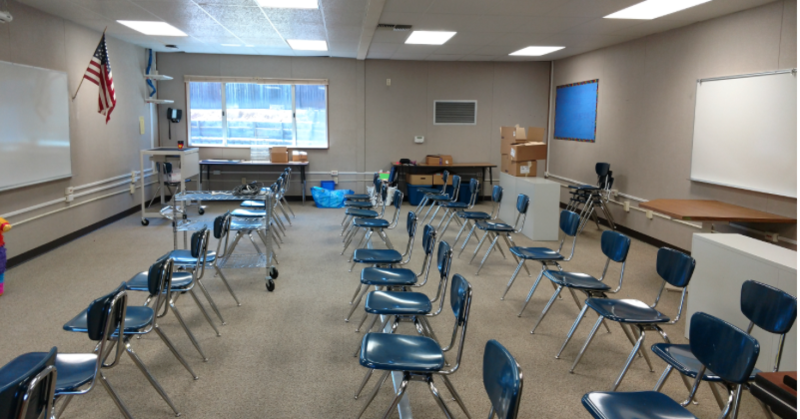 The 8th graders have gotten on board….there is a warmth to the room when we are together that is palpable. They smile. They share. They even try to show off their Spanish. Not everyone, but enough that it feels like we are in this together. It helps so much that a) I’ve had a week longer with them and b) they have had Spanish classes prior to this year and our work is connecting to those memories and class expectations. The 6th graders are new to a language class. This has been their first and only experience. They had 12 weeks of one set of rules/expectations and mine are clearly different. I am asking for their attention, for their comprehension AND their positive, respectful, creative responses. They are not used to that. They are not confident that they can deliver what I am asking for. And, let’s face it, it’s easier to chat with friends and not be prepared than to do what I am asking them to do. They ARE making progress in the language. They really are. But they still have trouble staying focused, and not talking with each other, for more than 3 minutes at a time. And this, of course, drives me crazy!!!!!!!!!!!! By the time Friday was over I was really frustrated. It had been a crazy week…like the week before vacation…two concerts, numbers of kids absent, a crazy schedule…ugly sweater day etc. Only it wasn’t the week before vacation…we still have school this week. I was having so much trouble seeing that this group of kids would begin to get it together and work with me instead of against me. It really seemed like more work than I had energy for. But then, today was Monday. It wasn’t perfect, but it was better. I think 65% of the students were with me instead of against me. When you start out with only 10% on your side, that is progress. And you know what? It is the week before vacation and much to my surprise, they brought presents. Presents! Wow. I haven’t taught middle schoolers in a while and their genuine desire to say Merry Christmas…or at least their willingness to deliver their parents’ greetings… really touched me. Relationships are being created. Trust is being built. It is just taking a while…as long as I don’t give up. TCI Maine, New England and Beyond! or…if you look at the top of this page, you will find it there! I’ll try to add things from past Maine workshops sometime this winter. Don’t forget to check above for additional TPRS and TCI trainings available !! Then he gave me permission to post on my blog what he borrowed that I posted on Ben’s blog. :o) Thanks Chris!! You can find that post here (and contrary to Chris’ opinion I am not a goddess lol)! !